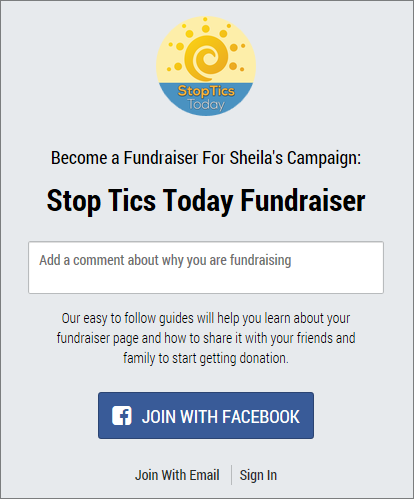 Fundraise to Help Stop Tics Today! Are you a go-getter who loves to make things happen? Are you passionate about our efforts to StopTicsToday and want to help us raise funds for research? Maybe you’re running a 5K or a marathon and you want your fans and supporters to show their support by contributing to your StopTicsToday fundraiser. Whatever kind of fundraiser you’d like to run in honor of our efforts, Fundly makes it fun and easy. 1. Visit our Fundly Campaign Page and click “Become a Fundraiser” on the bottom right side of the page. 2. Fill out the super-simple form to join and get started. 3. Add a personal story about why you’re fundraising for our campaign. 4. Let others know about your fundraiser by using Fundly’s built-in sharing tools. We’re so grateful for your support and look forward to seeing your Stop Tics Today fundraisers!